You have added Short and Sweet Lace Trim Heather Grey Shorts into shopping cart. If you want to look cute even when you're comfy, consider these adorable heather grey drawstring shorts with crochet lace trim on each side. The Short and Sweet Lace Trim Heather Grey Shorts are made of 100% cotton in a light heather grey color. 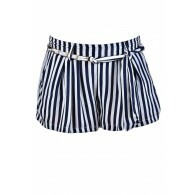 They have a banded elastic drawstring waist and a flirty short cut. 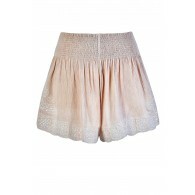 Beige crochet lace trims each side of these shorts and a pocket on each side at the back completes this look. The Short and Sweet Lace Trim Heather Grey Shorts are perfect to wear on days when you're lounging around at home watching TV. 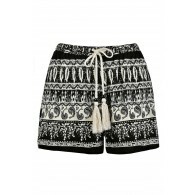 Pair these shorts with a fitted tank or tee and you'll look cute and casual at the same time. Details: Unlined. 100% cotton. Hand wash cold. Do not bleach. Hang or line dry. Cool iron. 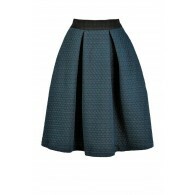 Small measurements: Length from top of waist to bottom hem: 9.5-12.5". Waist: 28". You have added Short and Sweet Lace Trim Heather Grey Shorts into Wishlist. 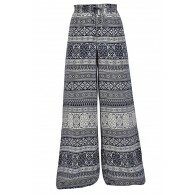 You have added Short and Sweet Lace Trim Heather Grey Shorts for Stock Notification. You have set Short and Sweet Lace Trim Heather Grey Shorts as a loved product. You have removed Short and Sweet Lace Trim Heather Grey Shorts as a loved product.